Nagaland is a beautiful and picturesque northeast state full of natural and cultural diversity. The unique yet diverse cultural traditions, amazing spread of nature makes it a great destination for travelers who are looking for adventure, cultural delight, and natural beauty. These places are a must visit if you are travelling to Nagaland to experience the great ethnicity of the region along with its vibrant natural beauty. They will evoke in you an utter sense of mysticism and pure delight as they walk you through to an interesting and splendid cultural plight of the Nagas. Kohima, the capital city of Nagaland, is often called the City on a Hill and a beautiful hill station rich and abundant in natural wealth. There are plenty of beautiful villages in and around Kohima which gives quite an interesting sneak peek into the amazing culture of the Nagas. The lively local markets, the winding roads, the plush greens fields on the sides of the hills all make Kohima a splendid place. The Kohima War Cemetery built in remembrance of the soliders who fought and died against the Japanese during the World War II is a must visit if you are in Kohima. Dzukou Valley is a splendid and breathtaking valley of flowers. Dzukou is very much unexplored and full of diverse species of flowers, herbs, and shrubs. It is also believed to be one of the best trekking circuits in the country. Khonoma Green Village which is located about 20kms from Kohima is a picturesque village known for its amazing spread of vibrant and plush green terraced fields. It is bedecked with nature’s pristine beauty in the forms of tall alder trees, rare species of plants and animals. Khonoma is wildlife and nature enthusiasts’ paradise. Japfu Peak is the second highest peak in Nagaland and known for its tall Rhododendron trees. The world’s tallest Rhododendron tree is found in the ranges of Japfu. Japfu is quite famous for its adventure trails and treks and provides some of the most amazing views of the Naga Hills and ranges from its top. 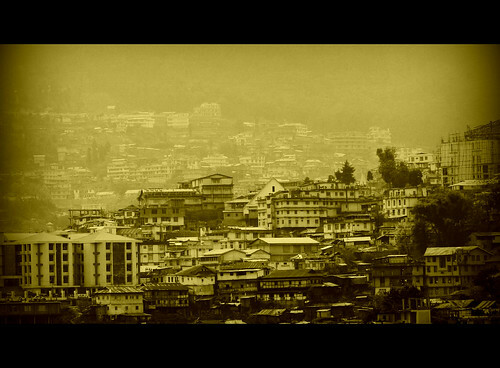 Our 3N/4D Kohima exclusive tour package is the best way to explore Kohima. Book Now! Saramati Peak is the highest peak in Nagaland and offers one of the best trekking experiences in the country. Located on the Myanmar border, Saramati Peak is indeed a must visit for adventure enthusiasts. Dimapur is the commercial hotpsot of Nagaland. There are quite a handful of resorts in Dimapur which are amazing retreats to soak up the pleasant natural beauty with a lavish dash of Naga hospitality. The historical monuments and medieval ruins are interesting archaeological aspects of this busy little city bordering Assam. Mokokchung which is land of the Ao Nagas is a beautiful and splendid place known for its amazing hospitality and age old customs and traditions. The villages in and around Mokokchung are simply amazing and full of cultural significance, and you will get to hear some of the most interesting folklores here. The caves, springs, and mystic villages make Mokokchung one of the most interesting places to visit in Nagaland. Mon district of Nagaland is a must visit in Nagaland for its amazing people, the Konyaks who were tattoed headhunters once and have an amazing culture. Konyaks are one of the most captivating Naga tribes and believed to be direct descendants of Noah. Tattoed faces, blackened teeth, and headhunting prowess from a historical standpoint makes Mon the most interesting place to visit in Nagaland. Benreu, located in Peren district of Nagaland, is a beautiful village that signifies the ethnic-tourism aspect of Nagaland. This beautiful village is a cultural paradise and also offers a wild safari adventure in the dense wildlife sanctuary around it. Meluri, located in the Phek district of Nagaland, is home of the Pochury Nagas and known for its indigenously prepared brine salt and amazing cane works. Doyang is the largest river in Wokha district of Nagaland. The meandering hill streams and the plush valley around it make Doyang an amazing sight. Ghosu Bird Sanctuary is located in Zunheboto district of Nagaland and provides for an amazing place to sight some of the rarest endangered species of Avifauna. These are only some of the greatest and the most popular places to visit in Nagaland. Nagaland is indeed vast and diverse when it comes to exploring its great natural beauty and the ethnic culture. And if you want to completely explore the mystic beauty of Nagaland, you need to take out a few good months from your schedule and spend it here in these mystic hills and exotic tribal villages. For more info on Nagaland, check out this book Nagaland: A Journey to India’s Forgotten Frontier .